At Amicus-IT we understand the need for retailers to provide a trouble free transaction and a smooth flowing customer experience at the point of sale. We also know what a critical role inventory management plays in a competitive retail industry. We look for systems that provide an effective point of sale as well as the important metrics retailers need to make intelligent informed stock purchase decisions. As IT professionals we also evaluate software systems based upon elegant software design, database retrieval efficiency and systems resource usage. 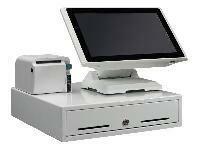 We endorse and support RetailEdge as the choice Point of Sale and Inventory Management Solution for the smart retailer. Not only do we work seemlessly with the RetailEdge technical staff, we can provide a turnkey product rollout. We will make sure the modern merchant is fully supported throughout the stages of initial store structure appraisal, system installation, staff training, all the way to year end reports. We provide premium help and instruction with department/class design, UPC's, merchandise tags, scanners, PO's, transfers, reports and much more. Well trained sales associates as well as profitable merchant financial statements are a priority at Amicus-IT. RetailEdge POS software has integrated credit card processing with merchant account services that will provide a low-cost and fully integrated solution for credit card and electronic payment processing. In most cases our merchant account partners will meet or beat your current or quoted providers Visa, MasterCard, AMEX or Discover rates. And you have a choice of partners to allow you to get the best rates and the features you need like EMV (Chip Cards), Apple Pay, Android Pay and new payment types as they are developed. Integrated credit cards offer the following bonuses to help improve your customers expiernce at checkout. Credit card information is not stored in RetailEdge so the customer can feel confident and secure. Checkout time is improved with 5 second approvals. New technology is available, such as, Apply Pay, Android Pay, Signature Capture and Tap and Pay.